Enter General Service Provider information including carrier contact information, carrier interface configurations, and accounting specifications. To access the Service Provider General Screen from the menu bar of the main TeleTracker Online screen, click Master Files, then Service Provider. Select the appropriate Service Provider and click Open. Click the General button on the left side column menu. Code : Assign the appropriate code to your Service Provider. Address / Phone Numbers / Internet : Enter the Service Provider contact information for reference. A located next to the link indicates that one or more required fields needs to be filled in or configured. Provider Type : This field indicates the type of products this Service Provider is valid for. Cellular/GSM/PCS will be selected for phone activations. For further information setting up your Service Plans, visit the Service Plans help page. If you are creating a new Service Provider, visit the Service Provider Setup Guide for a step-by-step process in building and creating your plans. 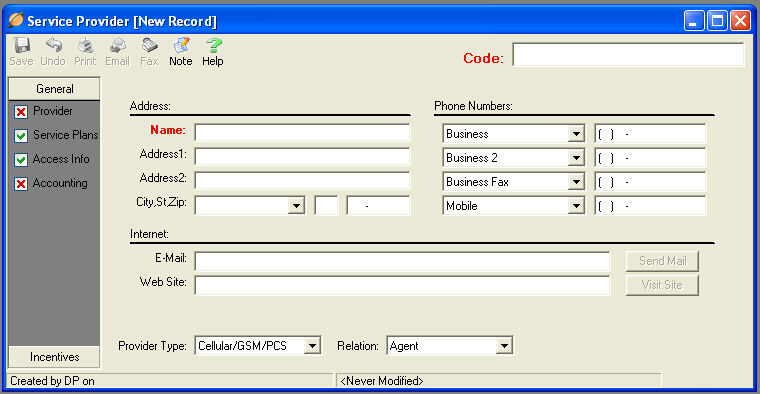 This window configures the TeleTracker Online Interface with Service Provider Credit Check website. Select the appropriate Service Provider from the drop-down list at the top of the window. Enter the website URL for each location listed in the window. Assign the appropriate G/L Ledger Accounts to the defined fields.